Release Date: July 20th, 2007 by Fox Searchlight Pictures. The Cast: Rose Byrne, Cliff Curtis, Chris Evans, Troy Garity, Cillian Murphy, Hiroyuki Sanada, Mark Strong, Benedict Wong, Michelle Yeoh. Directed by Danny Boyle. 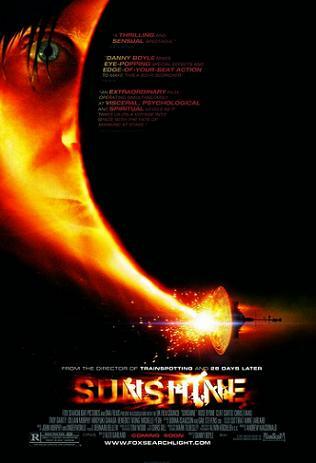 BASIC PREMISE: In the year 2057, eight scientists and scientists travel aboard the spacecraft Icarus II to drop a nuclear device into the dying sun. ENTERTAINMENT VALUE: Sunshine has awe-inspiring visuals and special effects and solid performance, but, just like last year’s sci-fi flick, The Fountain, it suffers from an unfocused, confusing plot that diminishes its suspense. During the last mission, Icarus I failed to transport a nuclear device to reenergize the sun, so it’s up to the eight astronauts and scientists on Icarus II to take over the mission. Capa (Murphy) has the expertise to detonate the nuclear device and leads his Icarus II team include Captain Kaneda (Sanada), Trey (Wong), Corazon (Yeoh), Mace (Evans), Harvey (Garity) and Searle (Curtis). As they travel toward the sun, their oxygen garden explodes, so now they need to find more oxygen in order for all of them to survive. Icarus I might be their only hope to find oxygen, but they won’t know its status until they explore it. At this point, screenwriter Alex Garland tries to add suspense with some strange, unexpected plot twists, but they feel quite mind-boggling once the confusing, gimmicky, action-packed third act comes around. Everyone gives a decent performance, especially Cillian Murphy, Michelle Yeoh and even Chris Evans, who you might recognize from Fantastic Four. None of their characters are developed enough so that you care about whether they live or die during this difficult mission. Director Danny Boyle does a masterful job of at least entertaining your eyes and ears with plenty of spectacular visual and sound effects which look great on the big screen. If only the plot were more focused and less gimmicky, this could have been much more suspenseful and engaging. IN A NUTSHELL: Visually stunning and often awe-inspiring, but with an unfocused, mind-boggling, gimmicky plot.